A mockup of Siri integration with the iOS Messages app. The voice assistant should be able to learn a person's usage habits and offer different actions based on context, The Verifier claimed. The lack of contextual awareness has been one of the chief criticisms of Siri, especially in comparison with Google Assistant and Samsung's Bixby. Google's AI, for instance, can not only pull data from the Web and a variety of services but accept follow-up questions that avoid the need to spell out a full command. Asking "who is the President of the U.S.," for instance, can be followed by "how old is he." 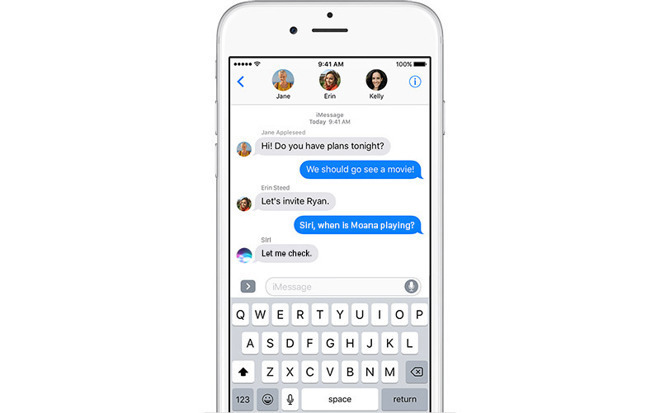 The iMessage integration will reportedly let Siri act based on conversations. Talking about eating sushi might prompt it to suggest restaurants, offer to book a reservation, or even arrange ridesharing. These claims may be at least partially based on recent patent filings. iCloud integration will allegedly be used to "identify the connections" between devices, and offer relevant actions on each. Apple is in fact said to be planning deeper use of Siri in tvOS and watchOS, for example expanding the number of commands an Apple TV understands. Apple should show off its new technology at the Worldwide Developers Conference in June when "iOS 11" will be announced, The Verifier said, cautioning that the company could postpone Siri features until later releases. Changes will also reportedly make their way into the next version of macOS. The Verifier is a relatively unknown site without an established track record. Recently it claimed that "iOS 11" will also support group video calls in FaceTime, finally catching up with rivals like Google and Microsoft.